Braces are an important treatment for addressing teeth misalignment and malocclusion, but their visual impact on the smile can be less than desirable for some patients. Doctors Lan and Viet Dinh offer treatment options that include alternatives to traditional orthodontics. Eastvale Dental provides Invisalign® clear aligners in Corona and the surrounding communities. Patients often choose Invisalign clear aligners over traditional braces because of their cosmetic and comfortable nature. These removable braces overcome the discomforts associated with standard orthodontic treatments. Invisalign clear aligners are made of translucent, unobtrusive plastic trays customized to fit each patient’s unique smile. As such, most people cannot see the aligners when worn. This allows you to straighten your teeth without detracting from your natural smile during treatment. 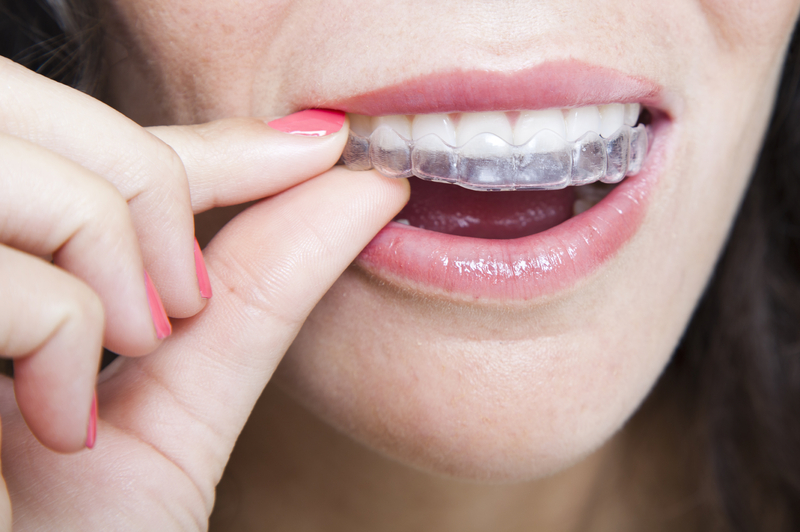 Invisalign trays also apply gentle force over the course of care. Whereas a patient undergoing traditional treatment might occasionally feel their cheeks or lips rub against the brackets and wires, someone wearing the clear aligners will not experience that sensation. This metal-free system leads to a more comfortable, less perceptible treatment. Does Invisalign Have Other Advantages? Invisalign clear aligners are more than just comfortable and cosmetic during application. They are also much more convenient, leaving your regular daily routine mostly unaffected. Traditional braces are cemented to the teeth, which can affect the way you brush and floss your teeth. Your diet during treatment may also change, as chewy, crunchy, sticky, and hard foods can damage the braces or are more likely to lead to tooth decay. In contrast, Invisalign trays are removable. As long as the aligners are worn for twenty hours a day minimum, you can take them out to eat what you want and to brush your teeth as you have always done. While they provide benefits to eligible patients, Invisalign clear aligners are not for everyone. The only way to know whether you can benefit from this orthodontic alternative is to visit our Invisalign providers, Drs. Lan and Viet Dinh. Our dentists examine your smile to see whether Invisalign or traditional braces are right for you and provide the appropriate treatment. Eastvale Dental offers Invisalign clear aligners in Corona. We have the experience and training necessary to provide both traditional and alternative orthodontic options. For more information, or to schedule your next dental appointment with us, call our practice today.